I quite often see iguanas as I’m walking down Flagler Drive in West Palm Beach. They like to perch up on the seawall along the Intracoastal Waterway and enjoy the day. But rarely do I see one this big. 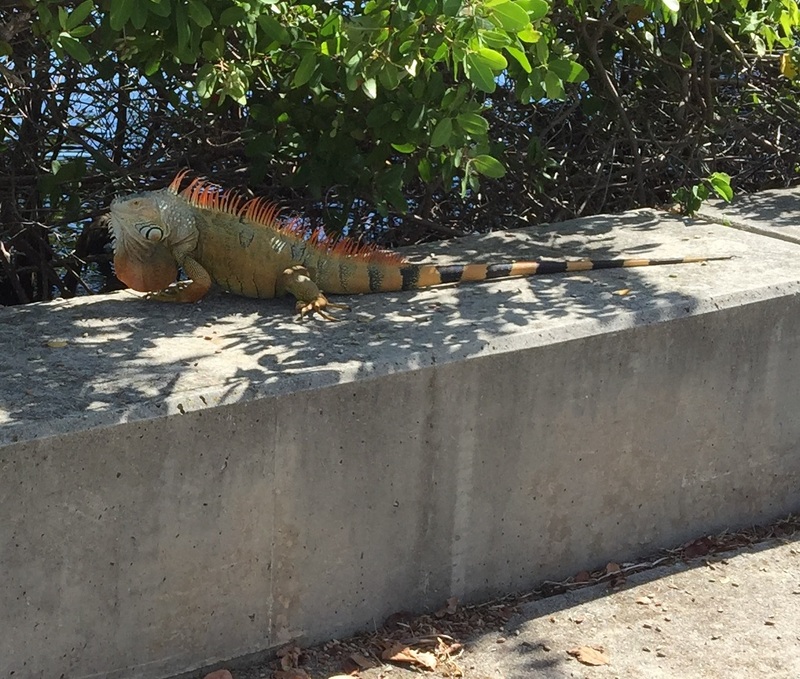 Also, an iguana will usually scamper away as soon as a person approaches, but this one seemed unfazed even when I approached it with my iPhone to snap a picture. Iguanas don’t have a reputation for being aggressive, but I wouldn’t want to get into a tussle with a creature of this size and agility. Experts writing for the site suggest: “Never feed iguanas.” Don’t worry. Iguanas started proliferating in the Keys about a decade ago. People were keeping them as pets and they either escaped or were released and then decided they liked the Florida environment just fine. Now they have gone as far north as Central Florida. In a Key West blog, a resident writes that while they are certainly exotic, they are also a nuisance. You never know when or where one is going to pop up. I was working around my outdoor bar, which has a large mature queen palm shading it. I heard a rustling noise and an iguana fell on the bar right in front of me. I didn’t wait around to take his drink order.